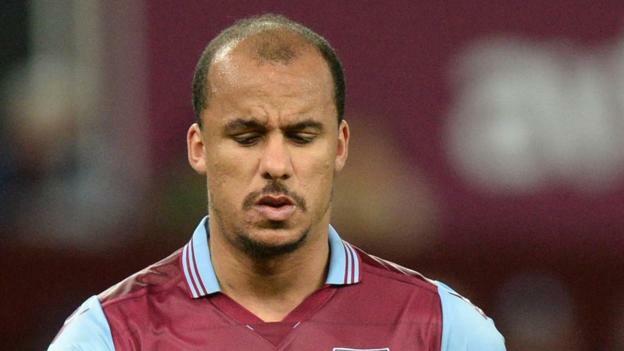 Agbonlahor Set to Suffer from Bent Buy? Gabby Agbonlahor has had a disappointing campaign for Villa this term in a season which began with injury and a lengthy lay-off with a groin injury. Despite returning to fitness the striker has failed to score in the Premier League this season in over 1000 minutes of action. The 24-year-old did net one in the Europa Cup Qualifying Round and another to extend on a decent record against Birmingham in the League Cup but has struggled in front of goal all season. His lack of goals has led Houllier to look to alternative options for the rapid frontman who has recently been moved onto the left wing. Martin O’Neill adopted a similar strategy upon joining the club, deploying Agbonlahor in a wide right position to decent effect. Agbonlahor has clearly worked on his delivery and his crossing has improved. His pace is an obvious asset for any winger but he lacks the flair of Albrighton or Young, adopting a more gun-ho approach. With the club having recently completed the record signing of Darren Bent, could Agbonlahor’s chances become limited without goals in his locker. Houllier is a huge fan of Emile Heskey who has been in outstanding goalscoring form compared to his usual self. Heskey has scored a goal every 150 minutes in all competitions with a record far superior to that of Agbonlahor. With Carew already forced out by the marquee signing of Bent I feel that Gabby may have to settle for a place on the bench soon if his form doesn’t pick up. If he were to play on the wing he still isn’t hitting the same sort of form of Albrighton and Downing so I feel he may miss out against Wigan with the arrival of Makoun and return of Heskey further increasing competition for places. I would have to say that a partnership of Bent to play off Heskey, a man who has benefited the likes of Rooney and Owen in games for England and Liverpool respectively, would be a more profitable one than that of Bent and Agbonlahor, which would no doubt offer one of the quickest strike forces in the league but could be somewhat one-dimensional. Who do you think should be the starting strike partnership? Do you feel that the current system of a lone striker should stay in place, further limiting the chances of the likes of Agbnonlahor?